Babu Kigongo hasn't added a story. 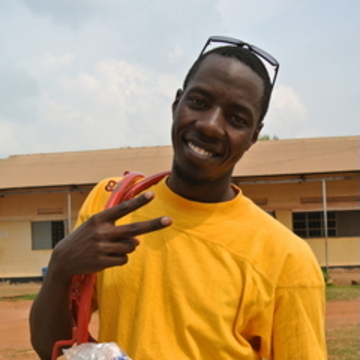 All-Stars In Africa is a sports outreach program to the youth in Uganda. It is our mission to go into the world and make disciples through sports by offering basketball camps to underprivileged schools and orhpanages in Uganda. We urge you to become a part of this ministry that shares the power of the Gospel and the love of Jesus Christ to the young nation of Uganda. We will be traveling to local schools and running a weekly after-school basketball program for kids who have a passion for basketball. For those of you who know of Athletes in Action in Canada, the program will be run in a similar format. Staring the month of October, I will be running the first program at a primary school here in Kampala for 6 weeks. We will be inviting all of the Grade 5 & 6 students who have an interest in basketball, regardless of their skill level, to come out every Thursday evening after school. The purpose of the program will be to develop the fundamental skills of basketball, to encourage personal growth, character, and sportsmanship, to encourage active participation in a fun, safe environment, and most importantly, to share the Gospel in a discipleship talk at the end of each day. All-Stars In Africa will be run at different schools and orphanages each month, and by God’s provision, it can even reach the schools in rural villages in Uganda. I am asking that you partner with me and my wife by praying for our ministry and the volunteer work that God has called us to this year. Beyond your prayers, if you are led to join me by financially supporting All-Stars In Africa I would be very grateful. In order to run the program we need to raise money for buying sports equipment, t-shirts for the kids etc... if we reach our goal of $3000 we will even be able to buy a vehicle necessary to transport all of the equipment and kids from different orphanages, and maybe even buy the kids some sneakers since most of them don't own proper shoes. I appreciate any level of support you are able to offer and I want to thank you for sharing with me in this journey God has called me to. Blessings in Christ. Babu Kigongo hasn't posted any updates yet. Babu Kigongo is managing the funds for this campaign. The campaign is for a personal cause.